How many of life’s most important lessons do we learn from children? I really don’t know how to answer that question; but, I know it’s a lot. I mentioned previously that I hoped to share a story involving one of my children that helps tie this discussion about living the good life and seeing the sublime all together. 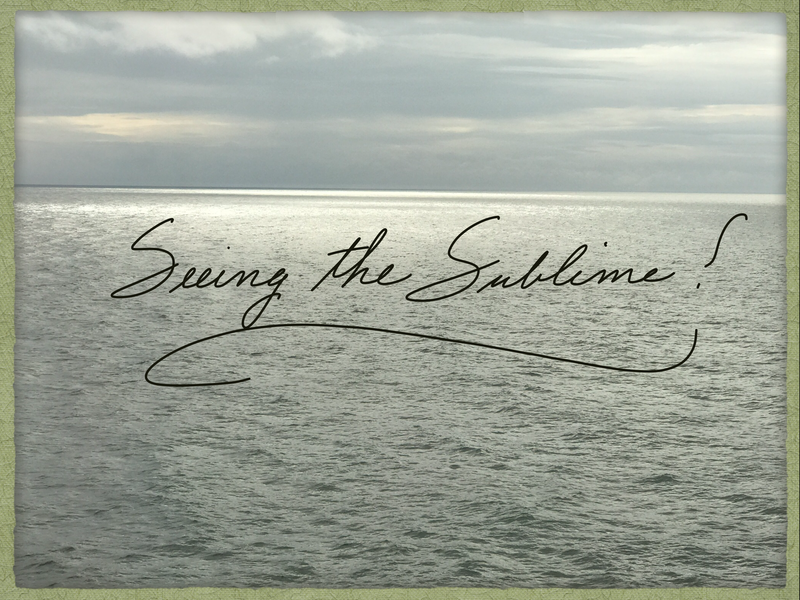 Seeing the sublime — learning from a child. Many years ago I started telling our children bedtime stories. It was great fun to make up fanciful stories about far away places. Sometimes the characters would do some really incredible things. They might wear absurdly funny clothes. They would sometimes do things that just wouldn’t square with the reality. Now, my joy is multiplied beyond imagining as I occasionally have the opportunity to tell bedtime stories to my grandchildren. This, alone, is a sublime experience. All four of our children have at one time or another looked over at me with an incredulous grin and said something like: “Dad?! That’s not real!” The giggles of grandkids, when telling the same stories, let’s me know they feel the same way. When children and now grandchildren nod acceptingly, we then pick up the story from where we left off. Sometimes they are not be able to suspend their disbelief and say, “This is just too silly to believe.” But, the story must go on! There are times, however, when we really do get into the story. We are carried away to the far-away-places of my imagination, where princesses, princes, and their pet dragons learn about life, love, and making a difference in the world. The wonderful world of make-believe is really real to me—real to us! As I think back to story time with my children, I remember that it gave me the deepest sense of pleasure when one my children would start leading me on return visits to the wonderful land created by our imaginations. It warmed my heart then as it warms my hear now to see the beautiful flower of imagination blooming a child’s heart. Once, a long, long time ago in a distant land called Kansas, when my story ended too soon, my youngest child did just that. As I knelt beside her bed smiling, I listened with joy and awe as she began filling in important details pertaining to the beautiful princess I had been telling her about. My heart was bursting with joy. The wonderful world of make believe was certainly real in her eyes. As I reflect on this, I can’t help but think that it must give our heavenly Father the same kind of pleasure when He sees His children believing and imagining that He can do wonderful things. It must give Him great pleasure when we become so enthralled with His story that we are caught up in it and carried away with it. Isn’t it wonderful to know that God has a sublime idea for our lives? It is even more amazing to think of just how eager He is for each one of us to surrender to His will and experience the full measure of His blessings.